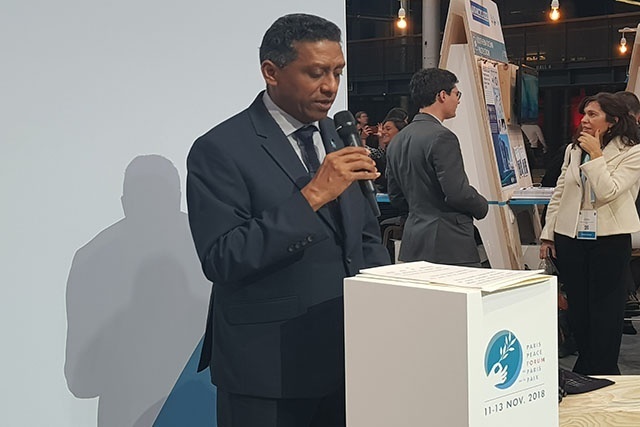 (Seychelles News Agency) - A healthy ocean is central to improving the livelihoods of all nations, regardless of whether they are coastal, the Seychelles’ President, Danny Faure, said in an address at the Paris Peace Forum on Sunday. Faure was attending the inaugural Paris Peace Forum at the invitation of French President Emmanuel Macron. According to State House, in his address to a group of civil society members, young entrepreneurs and university students in a breakaway session, Faure spoke about the landmark blue financing projects of Seychelles, a group of 115 islands in the western Indian Ocean. These projects include the debt swap for conservation and climate adaption and the world’s first sovereign blue bond launched by the island nation last month to support sustainable marine and fisheries projects. “By international standards, these are small transactions, but for a country like Seychelles, they are important first steps in our transition to a sustainable blue economy. We also hope that our first steps will guide other Small Island Developing States and countries toward their own sustainable blue futures, and eventually gather global momentum for a giant green leap for humanity,” said Faure. Seychelles with an Exclusive Economic Zone of 1.4 million square kilometres, is balancing the need to both develop economically and protect its natural endowment. The Paris Peace Forum was inaugurated on Sunday, November 11, 2018, which is also Armistice Day, marking 100 years since the end of World War I. It was aimed at reviving collective governance, international cooperation, and institution-building given the existing global context.